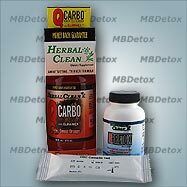 The 2 Step Cocaine Detox Program for persons under 200 pounds includes one bottle of QCarbo Easy Cleanser, one bottle of QPretox Daily Supplements (100ct), and one at home test device. QCarbo Easy Cleanser is available in 6 great tasting flavors: Cran-Apple, Cranberry, Grape, Tropical, Orange, and Strawberry Mango. Step 1) Start your detox program immediately by taking 2 capsules of QPretox twice daily. With QPretox you can start preparing up to 25 days in advance. Step 2) On test day, two hours before submitting your urine sample, drink the entire bottle of QCarbo Easy Cleanser. Step 4) Wait 40 more minutes, urinating as frequently as possible, and then use the home test device to verify your results before going to your test. Avoid any unnecessary medications and toxins for at least 48 hours before test day. This includes alcohol, tobacco, and any other drug.